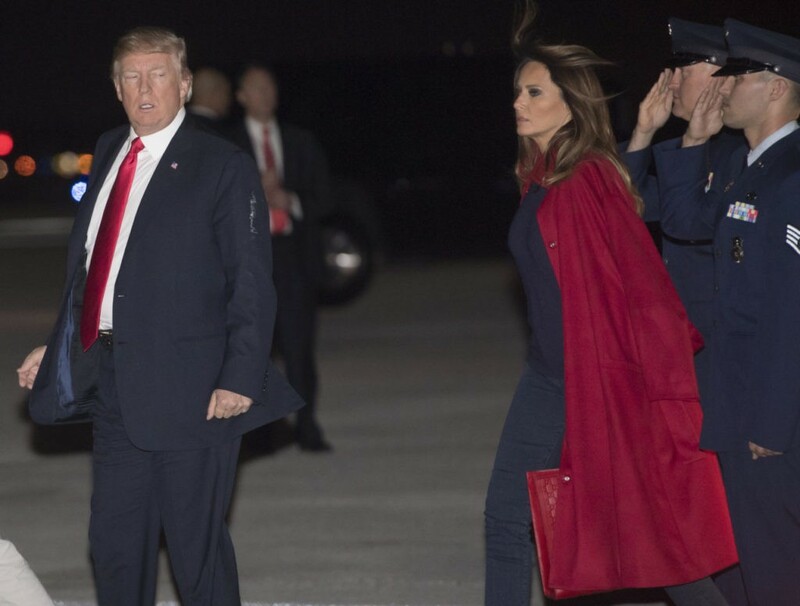 3 Feb 2018 Washington, D.C.
First Lady Melania Trump arrived at Mar-a-Lago in Palm Beach, Florida with President Trump and their son Barron, wearing a red coat with a matching bag and red shoe soles to tie the ensemble together. 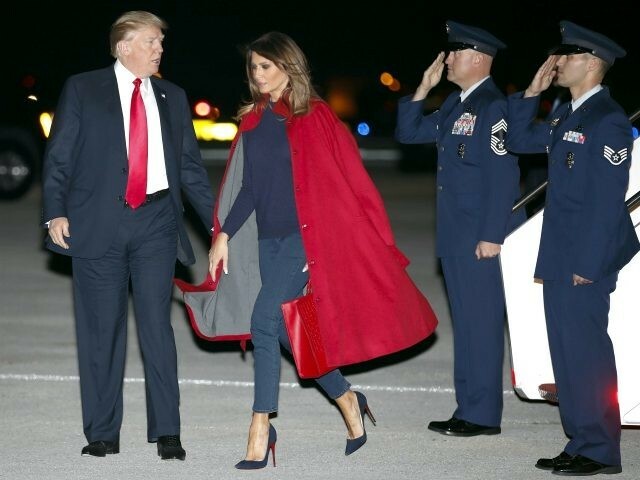 Melania, hardly ever photographed in blue jeans, wore a pair of skinny, ankle-cut jeans with a navy blue sweater as the base of her outfit. Draped over her shoulders, as she often does, the Slovenian-born First Lady wore a red cashmere coat by the Parisian brand Maison Ullens. 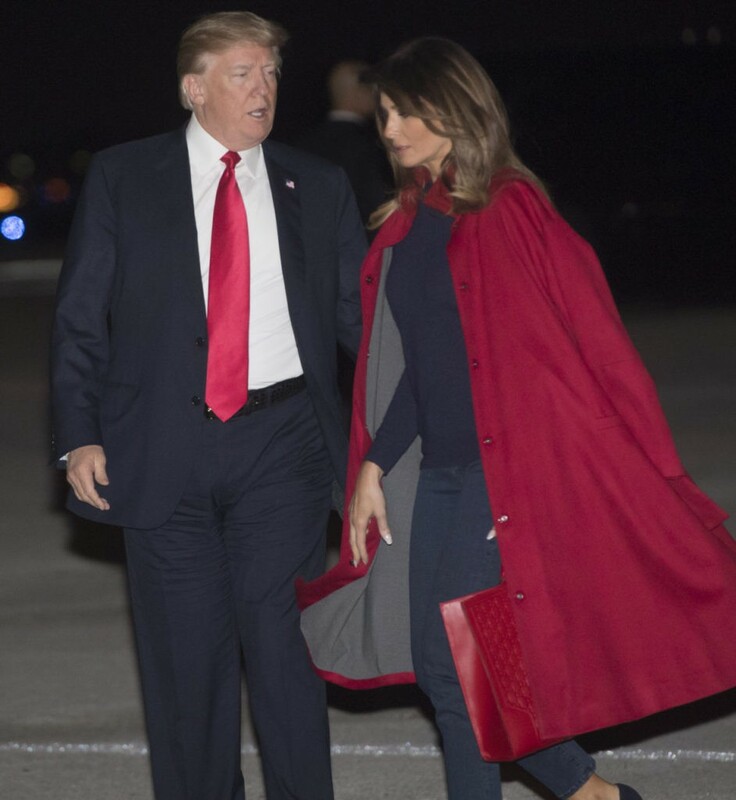 To match the coat, Melania’s freshly done manicure clutched a red leather Gucci bag that seems to be a tote version of this signature Gucci top handle bag. As usual, Melania topped the look off with a pair of navy blue Christian Louboutin stilettos, walking like a runway model off Air Force One, giving a glimpse of the shoe brand’s famous red soles. Melania and her husband will spend the weekend with their son Barron at the Mar-a-Lago resort to watch the NFL Superbowl, as they did last year.